Creating a community of sailors - through our directory of sailing organizations and contacts, we're developing links between sailors. Offering a resource - By pooling the knowledge of our readers, we're creating a directory of the suppliers of parts and services we all need. Keeping our boats afloat - Our technical articles focus on maintenance and upgrade issues and give them the space they deserve. The idea occurred to us way back in 1997 where our best ideas always originate: on the boat while cruising. "Let's create a magazine to unite the owners of cruising sailboats like ours: older boats, wonderful boats, well-loved, and frequently sailed boats." And so Good Old Boat magazine was born for sailors who own, maintain, sail, and love terrific fiberglass boats from the 1950s, 1960s, 1970s, 1980s, 1990s, 2000s and into the present. Founded by Karen Larson and Jerry Powlas, Good Old Boat magazine is a bimonthly publication for sailors focusing on maintaining, upgrading, and owning cruising sailboats built since the late 1950s. Readers are part of a community of sailors who have similar maintenance and replacement concerns. In addition, the magazine reviews sailboats in current use but no longer in production and publishes historical articles about the people and companies in the sailing industry who have influenced the fiberglass designs now considered to be "good old boats." The magazine is owned by Karen Larson and Jerry Powlas, under their S-Corporation, Partnership for Excellence, Inc., in Maple Grove, Minnesota. The company is a "virtual organization" in the sense that there is no headquarters building. The few full- and part-time employees and a large number of freelancers -- all of whom contribute regularly to the magazine content and production -- work in their own homes and are linked through email and servers. The magazine was founded in 1997; the first issue was published in June 1998. The publication is set up as a subscriber-supported magazine. It accepts advertising, but relies primarily on income from subscriptions and newsstand sales. 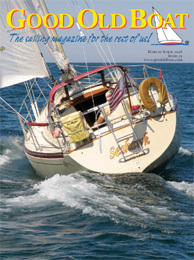 The magazine's website, www.goodoldboat.com, offers a wide variety of resources for sailors at no charge, including the largest list of sailboat associations and informal user groups in the world, a vast searchable database of marine suppliers, a treasury of sail insignia and cove stripes used to help identify boat manufacturers, a listing of free and inexpensive (available for less than $5,000) sailboats, a growing directory of sailing blogs, classified ads, parts catalogs, links, sponsored regattas, and more. In addition to publishing six annual issues of the magazine and six annual issues of a newsletter for subscribers, the company has also produced a large number of audiobook titles, featuring sailing classics along with newer fare: http://www.AudioSeaStories.com. An overview of the company was published in the 10-year anniversary issue, July 2008. A PDF can be downloaded at http://www.goodoldboat.com/pdfs/JA08_LaunchAmag.pdf. You can keep up with Karen and Jerry on their Good Old Boat Blog on Wordpress. And sail with them on their 2010 Great Lake Superior Adventure Blog.